Use electric mixer to cream the cream cheese and butter till smooth. Beat in cake mix. Mixture will be very thick, so be sure to mix well. Cover and refrigerate for 2 hours to firm up. Roll into balls and in confectioners sugar. 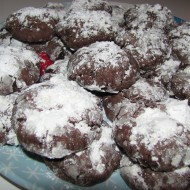 Cool and sprinkle with more confectioners sugar if desired.